Home Theater and Automation gadgets are my passion… but I’m also a hobbiest. 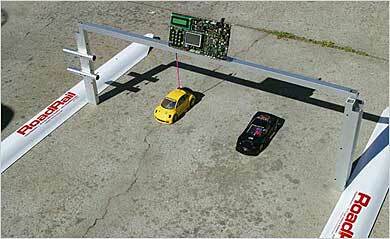 I’ve built a few model airplanes and own a couple nitro powered RC cars. GeekFreaks.com has a DIY Laser Lap Counter that will cost you less than $400 (in parts). A bit pricy, but it’s very cool and you can learn a lot about IRDA and the ZiLOG dev boards. If I were doing this, I’d ditch the lasers and use RF transmitters to capture data… it would also be cool to add GPS to the cars so you can track speed and driving skills. I’ll add this project to my ever growing list… ETA: 2 years.